This recipe comes from dubious beginnings – I was just looking for a way to use up extra oats I had ground. I was skeptical about these cookies because although I have been trying to bake healthier, these seemed too healthy. What emerged from my oven was a pleasant surprise. 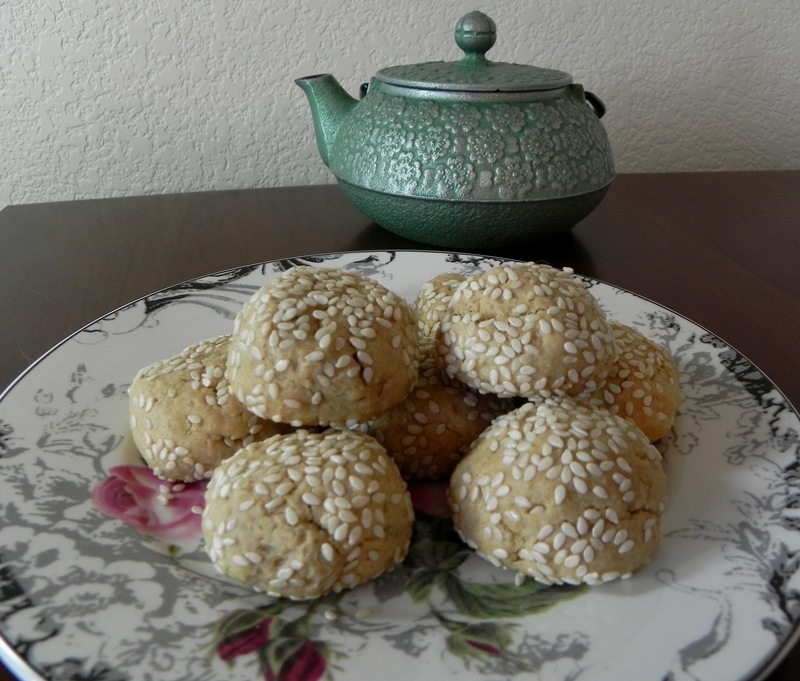 They taste a bit like peanut butter cookies but are more complex and with a hint of caramel. Even my chocoholic husband went back for more. The cookies were already vegan, so the high altitude changes I made were adding flour and reducing baking powder. I also added milk for a moisture boost. They can easily be made nut-free depending on the type of non-dairy milk chosen. Preheat oven to 350°F. Line 2 baking sheets with parchment paper. 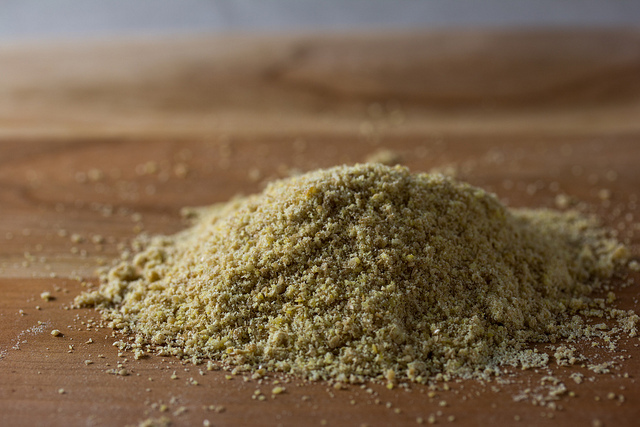 Grind oats in a blender until coarsely ground. Place in a bowl and whisk together with flour, baking powder and salt. Combine maple syrup, tahini, sesame oil, arrowroot and vanilla in a blender and blend until smooth. Stir tahini mixture into oat mixture. Spread sesame seeds onto a large plate. Form small balls of dough with your hands and roll the balls on the plate to coat with seeds. Tap to release excess seeds. Arrange dough on prepared baking sheets 2” apart. Bake until cookies are golden brown on bottom and puffed, 13-14 minutes. Let cookies cool on baking sheet for 5 minutes, then transfer to a wire rack to cool completely. Cookies will keep in an airtight container at room temperature for up to 5 days. Makes 24 cookies. These are not the prettiest cookies I have ever made. But what they lack in looks they more than make up for in flavor. Seriously, I can’t stop eating them. But, I digress. I was looking for something to test out my new “Super Flegg” of whipped aquafaba and flaxseed meal. 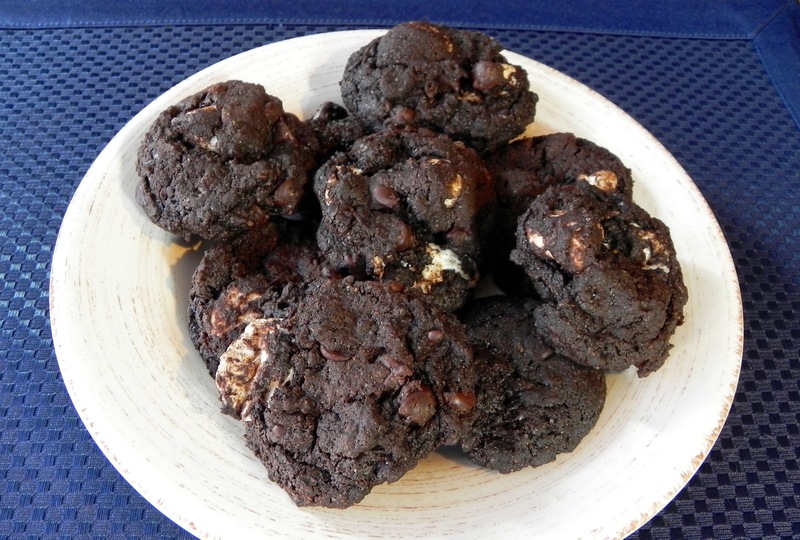 I also had stale marshmallows in the cupboard which are a required ingredient in this cookie. Thus, I had a great place to start. I veganized the recipe by using vegan margarine instead of butter and the Super Flegg for eggs. I also added milk to the ingredients to help with the dryness at high altitude. After getting the dough mixed I had my concerns. The dough was very dense, in fact I used my hands to incorporate the chocolate chips and marshmallows. I was scared that these would be hockey pucks. Then magic occurred in the oven. The brown lumps that emerged had a wonderful texture reminiscent of, well, campfire s’mores. And the taste was sublime. I had a cookie I could use to showcase the “Super Flegg” and my tummy was happy. Put marshmallows in an uncovered bowl and leave out overnight. Combine aquafaba and flaxseed meal in a bowl and let sit for 15 minutes to form a flax egg. Whip in a stand mixer for 3 minutes and set aside. Preheat oven to 350F. In a large bowl, whisk together flour, graham cracker crumbs, cocoa powder, baking powder, and salt. In a stand mixer, cream margarine and sugars. Add whipped flax egg and vanilla to stand mixer bowl and beat until well incorporated. Add almond milk. Slowly add flour mixture, stopping to scrape down sides of bowl. Stop mixing once dough is fully blended and don’t overmix. Stir in chocolate chips and marshmallows and mix evenly. Chill dough 15 minutes before baking. Spoon heaping tablespoonfuls of dough onto parchment-lined baking sheets and flatten slightly. Bake for 14 to 16 minutes. The cookies should be set on the outsides but still soft in the middle. Let cookies cool on the sheet for 5 minutes, then transfer to a wire rack to finish cooling. Makes 30 cookies. To embrace a new year of healthier baking, I thought I’d start with a muffin. Homemade muffins are generally lower in sugar and fat so I had a lot of options. 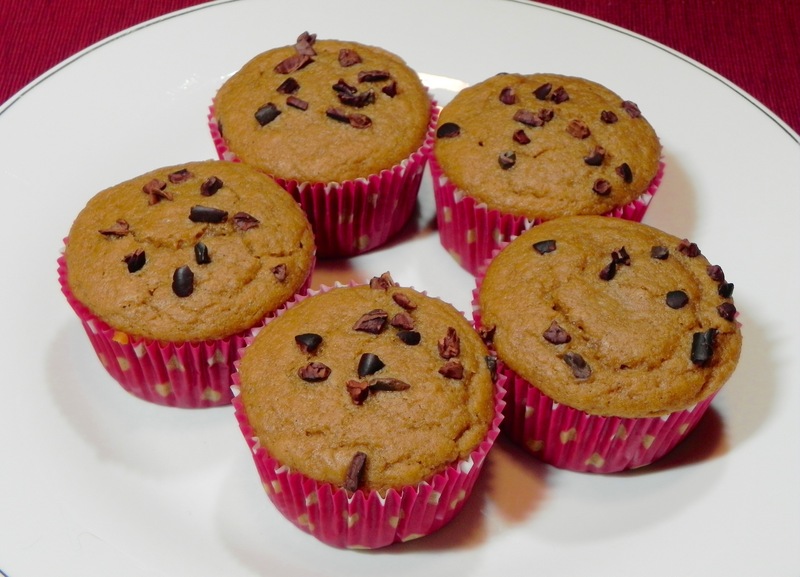 My search found a very healthy muffin – it had nutrient-rich molasses as one of the sweeteners as well as the addition of whole wheat flour. It also contained anti-inflammatory ginger and superfood cacao nibs. Healthy, here I come. To make adaptations for high altitude, I added flour and almond milk while reducing baking powder. I also added cardamon along with the other spices because, well, I like cardamom. The result was muffins with a flavor reminiscent of gingerbread cookies. 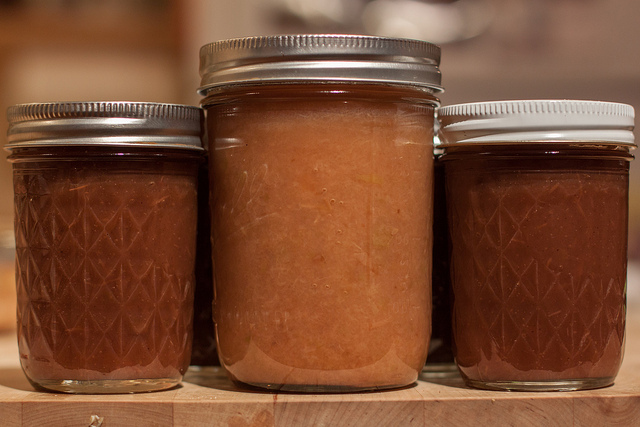 They were light and airy but dried out a bit after two days because I didn’t store them in an airtight container. It’s okay – they weren’t around long enough to dry out completely. Preheat oven to 350F with a rack in oven middle. Line a muffin tin with paper liners. In a medium bowl, sift flours, baking powder, ginger, cinnamon, cardamom, and salt. Whisk lightly to aerate. In another medium bowl, whisk milk, maple syrup, molasses, oil, and vanilla. Pour liquid ingredients into dry ingredients and whisk until smooth. Divide the batter evenly among 10 muffin cups. Scatter cacao nibs over tops. Bake for 15-17 minutes, until a toothpick inserted in the centers comes out clean. Cool pan on a wire rack for 5 minutes, then turn out muffins and cool completely on rack. Makes 10 muffins.